Sellers often prefer to sell the horse from a yard. The yard may have superior facilities in which to allow the seller to demonstrate the horse's ability, riders on hand who can get the best out of the horse, and surroundings that impress buyers; and the owner doesn't need to spend time arranging viewings, answering questions, or being at viewings. 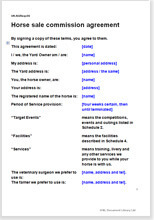 It is usually yard owners who set the terms of a commission agreement (and thus use this template), but there is no reason why a horse owner could not use this document to gain more favorable terms with a seller who does not have a standard sale agreement. Although this document is drawn to protect the yard owner's interests as strongly as possible, the draftsman has also considered what your clients will think when you send it to them. It is written in non-legalistic language. Even though horse owners will not worry that they have to see a solicitor before they sign, the legal effect remains strong. "A great site for small business owners. I have required two documents and you have been able to provide both at a modest cost. Both documents have met with my requirements and saved me on legal fees. Keep up the good work." "Quoted £1000 by my companies law firm - paid £10 with Net Lawman."